Ferndale, MI- Bus stops are bitterly cold this time of year, Downtown Ferndale’s Rust Belt Market has found a way to spread a little warmth to the busy 9 Mile and Woodward intersection. This first happened in 2015, when several Ferndale women began leaving scarves with notes at the bus stops. Rust Belt Market owners Chris and Tiffany Best welcomed the idea at their corner property and had the signs made. 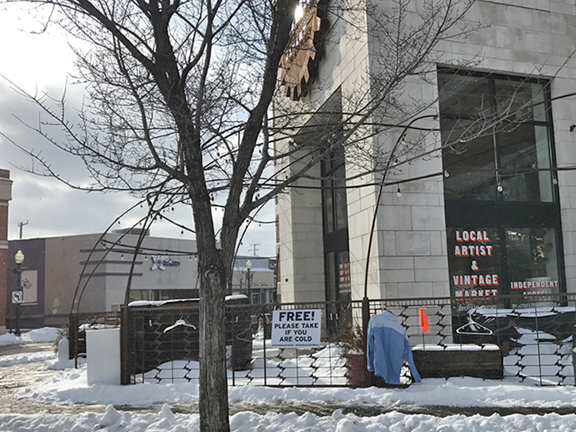 The momentum fizzled with a few milder winters, but with 2019’s Winter Vortex putting Ferndale in below zero temperatures, one of The Rust Belt’s longest vendors stepped in to revive the tradition. “It’s been a huge hit. It’s a lot of people that are homeless or they are getting on and off the bus. It’s also been people that seriously need warm clothes. Those two spots are perfect because you can hit them from either bus stop,” she said. People are welcome to hang new or gently used items near the signs to keep the supply up. 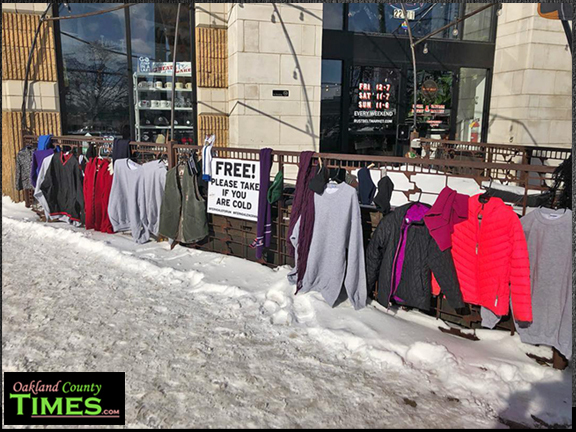 Items are being claimed quickly, and it’s up to the public to keep the warmth going by leaving donations. To read about the 2015 effort, click here. For more on Rust Belt Market, click here. For a list of Resources for those in Need, click here.